The Holy Land where the University stands was first transformed into a centre of learning in 1936 by Bhagat Phool Singh Ji when he started a Gurukul for girls. The Gurukul was opened after he opened a boys Gurukul in 1919 in Bhainswal Kalan which today is the South Campus of the University. 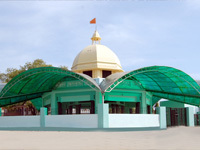 The Gurukul, started with only three students grew in size, stature and reputation with time and in November 2006, the Haryana Legislative Assembly passed a Legislative Notification, vide no. 31/2006 making the Gurukul a full-fledged State University. Bhagat Phool Singh was a Patwari (revenue collector) who turned a social reformer under the transforming influence of Arya Samaj and the idealism of the freedom fighters of the times, particularly Mahatma Gandhi. During the 1930s, when even the existing institutions were struggling for survival, Bhagat Phool Singh dared to establish a new one against all financial and cultural odds. His daughter, Subhashini Devi, who inherited the responsibility of running the Gurukul amid fierce constraints, financial as well as social, helped the Gurukul grow into a number of professional colleges for women. She passed away in March, 2003, leaving the management of the Gurukul in the hands of the Mahasabha. Finally, in November 2006, the Mahasabha Gurukul Vidyapeeth, Kanya Gurukul, Khanpur Kalan was turned into Bhagat Phool Singh Mahila Vishwavidyalaya.